I’m in love with Mary Martello. Why pretend otherwise? (My husband knows, by the way, and he’s fine with it.) I mean, who wouldn’t be? As an actress, Martello is an irresistible combination of effervescence and grounded-ness, abounding in good humor and common sense, alluring yet practical. And, like Shakespeare’s Cleopatra, with the years she only grows better — more interesting, funnier, sexier. 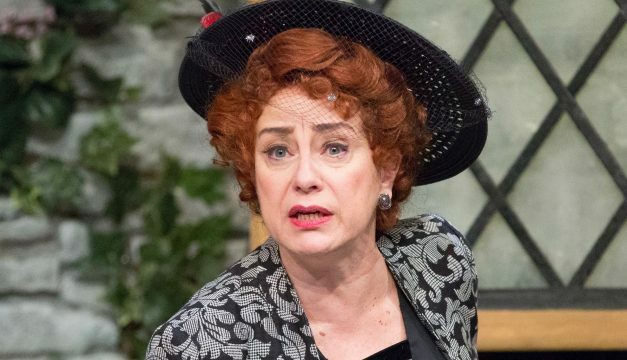 So kudos to the smart people at Lantern who thought to showcase her as George Bernard Shaw’s great anti-heroine, Mrs. Kitty Warren — a character who looks back to Ibsen’s great female roles , and paves the way for Brecht’s. Mrs. Warren is charming, ruthless, and gloriously unapologetic. Ms. Martello is all these things and more. What has Mrs. Warren to apologize for, you ask? That’s the stick of dialectical dynamite in this play. The privileged life she has enjoyed — and bestowed on her daughter, Vivie (who has recently graduated from Cambridge) — was financed through prostitution. Mrs. Warren — shocking when it was written more than 100 years ago, and still startlingly modern — isn’t simply about the world’s oldest profession. It takes on an entire class system and the economic structures that reinforce it. It’s one of Shaw’s earliest plays, and hasn’t the grandeur or slyness of his later and even greater work: Saint Joan, Pygmalion, Major Barbara (though it shares with the latter the delicious moral conundrum of a disapproving child who nonetheless has profited from a parent’s questionable career). Mrs. Warren never quite bridges the distance between the drawing room comedy it initially appears to be, and the agitprop manifesto it ultimately is. It’s a problem not completely solved in this production, directed by Kathryn MacMillan, and featuring a fine supporting cast, among whom David Bardeen and Daniel Fredrick especially shine. Sometimes, the delivery is too arch. There are sentimental and serious moments in the play that could register more deeply. I’d like to see a more vibrant, detailed sense of household life — there’s a lot of posing here, which won’t dilute the common criticism that Shaw is too talky. 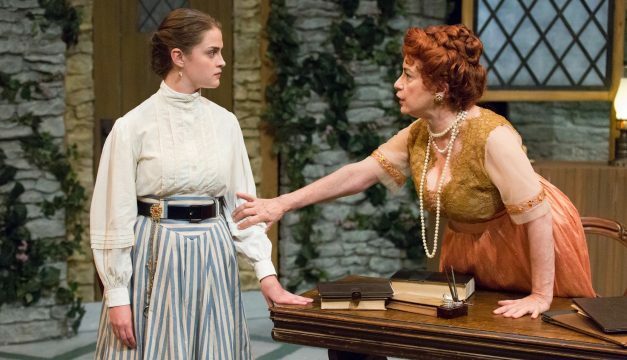 But Mrs. Warren’s Profession is a play done too rarely, and Lantern’s highly enjoyable and gripping version should be seen. (A word to the wise: buy your tickets soon — it’s already a near-sellout.) And when Mary Martello’s Mrs. Warren takes to the stage, there’s a level of mastery that quashes all criticism. What’s more, she makes it look effortless. Mrs. Warren’s Profession plays through October 9. For more information, visit the Lantern Theater website.